According to a report released this week by the U.S. Energy Information Administration (EIA), the United States will become a net energy exporter in 2020 due to large increases in crude oil, natural gas, and natural gas plant liquids (NGPL) production coupled with slow growth in U.S. energy consumption. 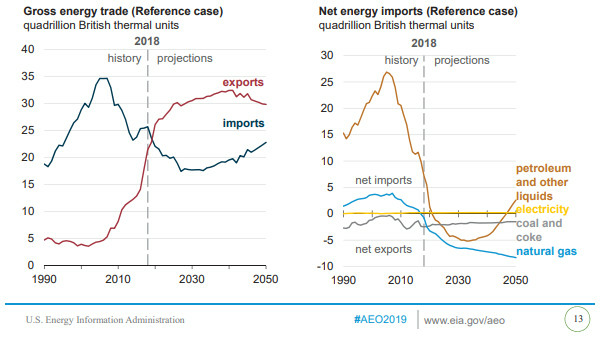 The EIA's Annual Energy Outlook 2019 stated that of the fossil fuels, natural gas and NGPLs have the highest production growth, and NGPLs account for almost one-third of cumulative U.S. liquids production during the projection period (through 2050). Another key takaway from the report is that increasing energy efficiency across end-use sectors is expected to keeps U.S. energy consumption relatively flat, even as the U.S. economy continues to expand.